You are here: Home / All Freebies / Basic Facts Math Jenga! You can make your classroom Jenga set into a fun game for reviewing math facts. 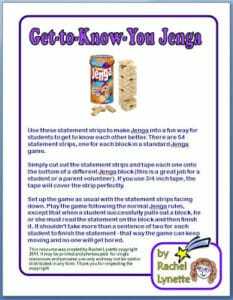 Just download the free math fact strips below and tape them to your Jenga blocks. When a student pulls out a block, he or she must answer the equation. Addition and Multiplication Facts Jenga! We do a class gift exchange where the students bring gifts for the class to use during the year. One student gave the class a Jenga game, so this is a great resource! Now we can use this game not only during inside recess, but also during math stations!